Finishes vary greatly - smooth, split, slump, shot blast, ground face, etc. The concrete is anything from regular aggregate concrete to various mixtures of light weight aggregates. 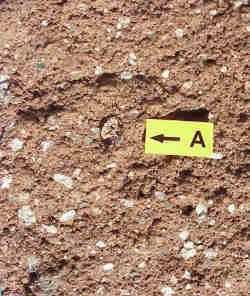 Usually colored with iron oxide pigment throughout the mixture. Some types of concrete block can be very absorbent and will tend to soak up a lot of sealer if you just keep pouring it on. Too decrease the amount of sealer required see the label suggestions. Concrete Block are produced in a great variety of colors and shapes that allow for a wide spectrum of creative design. Highly textured block are difficult to clean of residue from grouting. Do not use a sealer as a grout barrier ( pre-seal). Prevent grout smears, surface scratching and keep grout residue out of surface texture by coating with Aldon Grout Easy before grouting. "Grout Easy" is a water soluble coating that comes off easily while grout is being cleaned up with water and a sponge. This product is used for "Thin brick " with grout pumping to greatly reduce clean up time. Efflorescence (subsurface originating white powdery stains) happens all the time on Block structures. However, this is easily cleaned and can be prevented from coming back. Fading: . Actually Concrete Block do not fade. The appearance of fading is actually from light efflorescence and can be stopped by sealing with the appropriate Aldon sealer. See proof here. 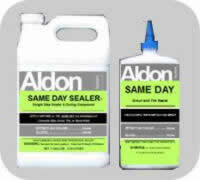 Block or mortar that are soft, crumbly, powdering - reinforce all of it with the choice of one of Aldon's "solvent based - penetrating" sealers shown below. * Should not be needed after using Grout Easy. Use carefully on concrete Block. #2. If the Block is grouted, but never sealed. * If you have old grout smears. Use carefully on concrete Block. #3. If the Block has had a sealer applied in the past. * If, after stripping, you find old grout smears or crystal efflorescence from years ago. Use carefully on concrete Block. Showing "Same Day Sealer" on Block. This sealer is Water Base | Penetrating Type. Provides: No color enhancement or gloss. Coverage guidelines (depending on absorption) 250 to 600 sq.ft./gal. Picture: Split block (the most porous of textures) sealed with "Same Day Sealer". Note arrow showing a water drop beaded up and not absorbed. The sealer is invisible. Easy Care Products: for flooring. "Maintain" - for no streak wet mopping of Block and all other types of flooring. You may have heard of concerns about Concrete Block. All of them would be prevented with the information we provide here. Therefore, you can have the look you want!